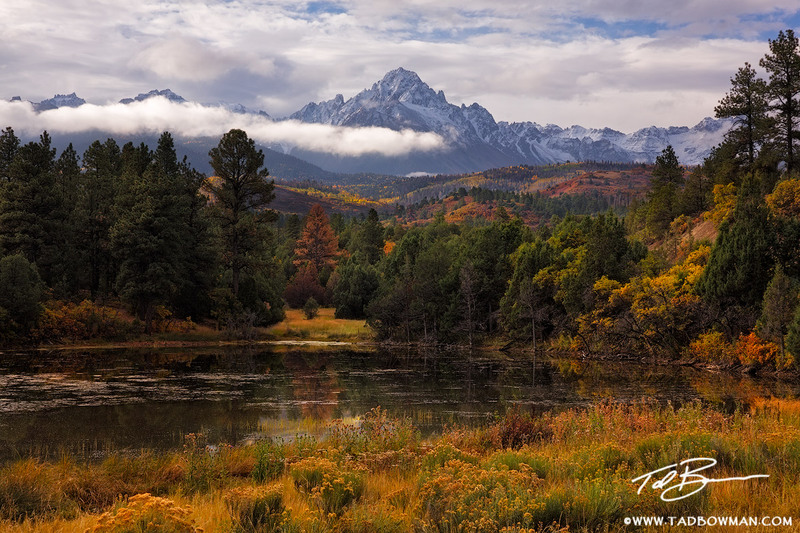 This Colorado mountain photo depicts clouds surrounding Mount Sneffels with fall foliage in the foreground. Photo © copyright by Tad Bowman. A glossy photograph is mounted to the back of 3/16" art-grade acrylic giving it an unbeatabley crystal-clear, three dimensional feel as the picture is seen thru the acrylic. It is both UV protected and scratch-resistant. A 1/8" black, acid-free board is provided on the back to fully encase and protect the artwork. A french cleat hanging system is attached to the back so the print floats off the wall. Please allow 3-4 weeks for delivery of the canvas gallery wrap. These prices apply to United States domestic shipping only. Please contact me to discuss international shipping. All material © copyright by Tad Bowman. All rights reserved. Site by WideRange Galleries.